In Part 1 of this article series, we discussed the importance of stability in your levels. Stability is crucial to keeping a healthy SPS reef. We learned that your alkalinity was the key to this success followed by other parameters like calcium and magnesium. Now let’s talk more about testing and dosing. All three elements are required for the calcification of your stony corals: Alkalinity, Calcium, and Magnesium. As they grow, they consume these elements from your water and therefore need to be replaced. Available on the market are various forms of test kits, all of which are viable for testing your levels. There is a degree of variance between test kits, it is not correct to assume that the more expensive brands are more accurate. It eventually comes down to personal preference. Testing your various levels is extremely important to calculate how much you need to dose to maintain your levels. You need to obviously first obtain your kits and also a refractometer to be able to test your salinity. Your waters salinity should be kept at 1.025 to 1.027. Testing is best done at the same time each day. The reason for this is that your levels can and will fluctuate during the day based on dosing and consumption. 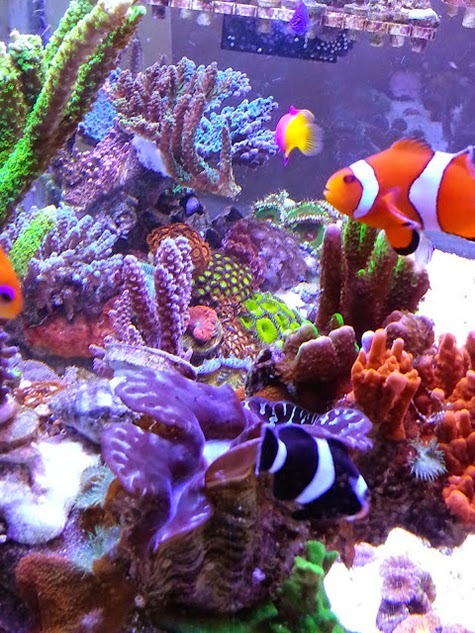 We suggest doing a water change and testing every day after that or every other day till your next water change. This gives you a baseline for the consumption in your tank. You will notice how much your tank will consume each day, that is how much of each element that you need to replace via dosing to maintain optimum levels. Before you begin dosing, you need to lock in the numbers you want to maintain. For example, some of the salt mixes on the market contain high levels of alkalinity, usually in the 9-10 range. If you want to maintain a level of 7, you need to let your levels slowly drop and then begin dosing based on your daily consumption. For calcium we suggest maintaining a range of 400-420 and for magnesium we suggest maintaining a range of 1250-1350. Dosing can be done several ways. The most common way is by using 2-part solutions. You will have one solution for your bicarbonate (Alkalinity) and one for your calcium / magnesium. 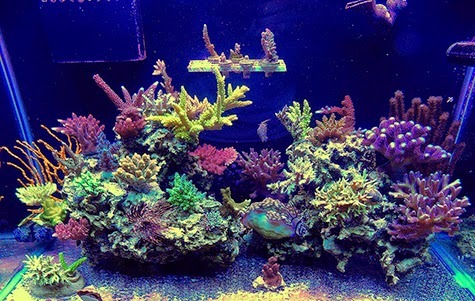 As your corals go through the process of calcification they will use the same amount of alkalinity as calcium therefore when dosing 2-part you should be dosing equal, if not close to equal, parts of each solution. These doses can be done manually, but we suggest using a doser to dose at multiple times each day for your best chance at stability. Here we can venture into a debatable topic, the question of low nutrient or high nutrient systems. When we speak of low or high nutrient systems we are talking about your nitrate and phosphate levels. The reason why this is such a debated topic is because both sides have been proven to work, yet there is still a controversy as to which is more effective. The norm has been 0.00-0.03 PPM (Parts Per Million) Phosphates and 0-5 PPM Nitrates. You may experience browning, dull colors, tissue necrosis and poor growth at levels higher or lower. Yet there are plenty of successful tanks out there where these guidelines have not been followed. This leads to the question, which is more effective and are we incorrect when saying we must aim for these low numbers. Arce: To get a better understand of both sides of this situation we plan to discuss both of our tanks. Coincidentally we both have different viewpoints on low vs. high nutrient systems. MetroKat believes in a higher nutrient system, while I feel a low nutrient system is better. Despite our different opinions, as you continue reading do not only look at the differences between our tanks but what we both have in common, as that will provide us with the answer to the ultimate question. My routine provides plenty of food for both my corals and fish/inverts but the one thing I try to do is remove it as fast as possible to reduce spikes in nutrient levels. My daily feedings include 2 “cubes” of frozen foods, daily dosing of Acropower, and daily broadcast feedings of either Reef Roids or Reef Snow. For frozen foods I usually just feed PE Mysis or Reef Frenzy. The majority of it doesn’t get eaten by fish, but my snails, hermits and other inverts do a good job at eating the remainder. Anything that doesn’t get eaten will eventually break down and enter the water column as smaller particles which in turn feed SPS or other filter feeders. As I said, I feed and then aim to remove it as fast as possible. This is done by an oversized skimmer, a ‘fuge full from corner to corner of chaeto, filter socks which are cleaned every couple days, and finally weekly water changes. Having a bare bottom system has also been key to my methodology because wastes do not settle in a sand bed and are picked back up into the column to be exported by any of the above means. MetroKat: I feed my corals daily. I rotate between a variety of about 20 live, frozen and freeze dried foods so I am likely to repeat the same food only after a couple of weeks. There are some foods I throw in daily, however, like live phytoplankton whenever I have it, or preserved. I pay attention to the particle size of the foods very carefully. For SPS I feed 0.5 micron and slightly higher such as phytoplankton, golden pearls, NLS Nutri/Cell, Reef Roids and Rotifers. LPS get more meatier foods like krill, mysis, roe and copepods. I also have a heavy fish load which contributes to the nutrients. To balance the equation, I run an oversized skimmer, and a large fuge with a variety of macros, sponges, Xenia, live rock and sand. I also run a phosphate reactor. In addition I give my corals a lot of light and flow, and maintain temperatures in the 78 range. My corals have a healthy color and growth. I don’t overdo the nutrients, I maintain a balance as much as possible. 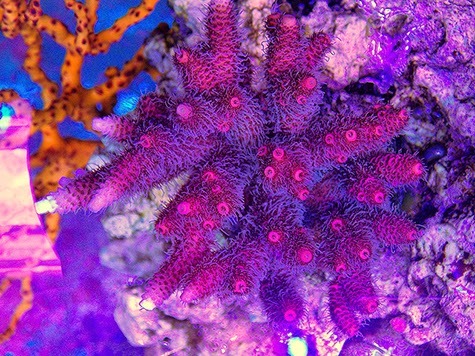 My corals are the first indicators of the balance being upset for any reason. Coralites look stunted instead of sharply defined, the color changes, there are plenty of visual clues to tell me that something is off. I much prefer running a high nutrient system over one where I constantly test and worry about levels. Both high and low nutrient systems have unique features, pros and cons. Which one works for you and the husbandry that you are most comfortable with will determine the path you follow. In both cases, SPS show growth, health and vitality. There really isn’t one better methodology over the other. However in both cases, maintaining a balance is absolutely essential. In a high nutrient system if it gets out of control you have problematic algae, browning by over abundance of zooxanthelea in a high phosphate environment. In low nutrient systems, ultra low levels could show you corals that are starving, pale in color and a lack of growth. Arce: Names Justin Arce, known as “Arce” on forums. My experience in reefs has been short, with only two years experience, but my current tank, a standard 29 gallon has proven to be a successful SPS reef. My addiction to sticks is obvious when looking at my tank, and especially when looking at my wallet.